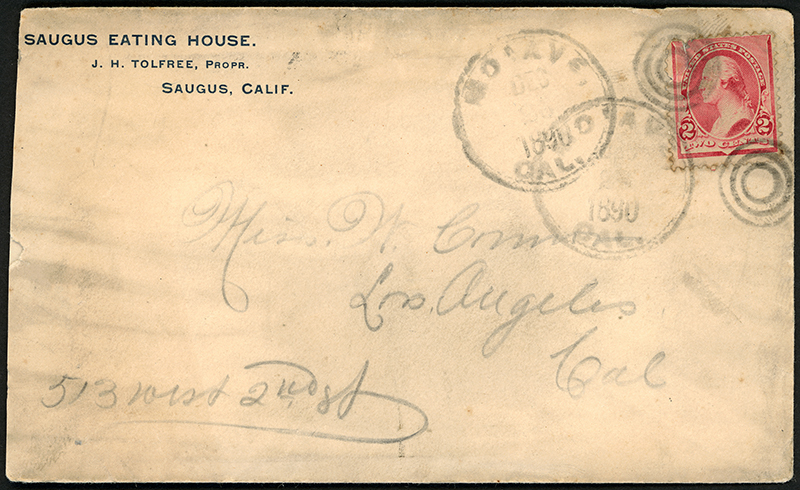 SCVHistory.com LW2074 | Saugus | Envelope From Tolfree's Saugus Eating House (Later Saugus Cafe), 1890. Cancellation on back of envelope. Imprinted envelope from the Saugus Eating House (later known as Saugus Café), J.H. (James Herbert) Tolfree, proprietor. Addressed to Miss W. Connor, 513 West 2nd St., Los Angeles, Cal. Postmarked Mojave, Cal., 1890 — three years after the café opened inside the Saugus Train Station. 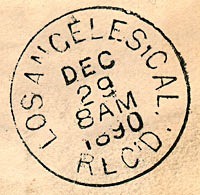 Received in Los Angeles (postmarked on back) at 8 a.m. Dec. 29, 1890. In addition to Saugus, Tolfree also ran "eating houses" inside the depots at Mojave and Bakersfield. LW2074: 9600 dpi jpeg from original envelope purchased by Leon Worden.